HomeImplementationWhat does it look like? Let’s return to our original diagram of a performance management system and take a closer look at each component. Consent forms let clients know how their data will be collected, stored and used. Clients can also give consent for data to be shared by service delivery organisations working together. Research from the Royal Statistical Society in the UK suggests it is more likely that clients will prefer their information to be shared between services than not shared[i]. The case management system should be built to mirror the service delivery model, not the other way around. At this stage, working collaboratively to decide what data to collect is crucial to the success of the system. The system should include fields of data (e.g. the date a training course began) that help the caseworker to deliver the service and fields that indicate progress. These should overlap as much as possible. For services with multiple providers, a shared case management system allows for richer data and facilitates collaborative service delivery. Recording data can be time-consuming and boring. The process is facilitated by making it more convenient. This may involve remote access, voice recording or smartphone apps. Performance management systems should be responsive to the people using them. Delivery staff should be encouraged to request further evidence and analysis as they need it. As well as technical skills, the analyst needs to understand the perspectives of each of their audiences, and be able to communicate in language that is appropriate for them. Their role is not only to report information, it is to interpret that information for each audience. The performance analyst must be, to some extent, a data salesperson. 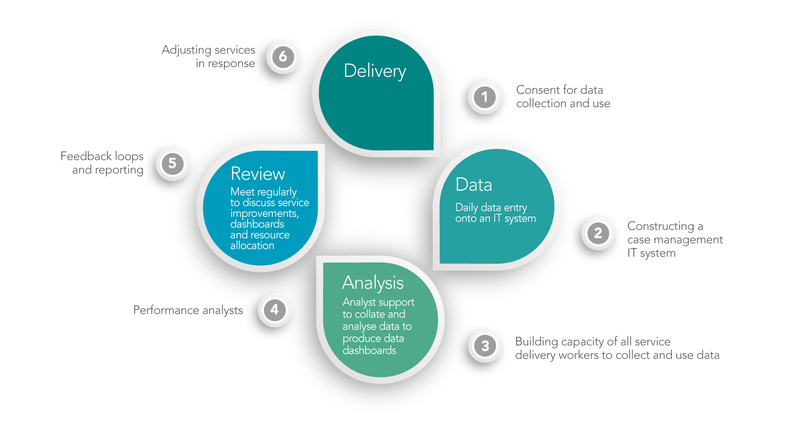 Adjusting a service delivery model is a collaborative process. All stakeholders of the service, including clients if relevant, should be involved in reviewing evidence, and then implementing and testing each adjustment. [i] McDonnell, S (2014). New RSS research finds ‘data trust deficit’, with lessons for policymakers. News article 22 July 2014. StatsLife. Royal Statistical Society.